The term 'Durbar'comes from locations built next to or around a Royal Palace, so there are many Durbar Squares. Kathmandu's Square is officially titled Hanumandhoka Durbar Square. 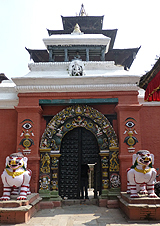 For many centuries the Palace was occupied by the ruling Royal's but when When Prithvi Narayan Shah and his Army invaded the Kathmandu Valley he preferred his Palace elsewhere and moved to Narayan Hiti which has remained to this day. Even so, this Square still venues major Royal and Constitutional events, both recent Kings were enthroned here. Today it is one of the most visited places in Kathmandu, helped by the fact it is easily reached on foot from the Thamel Hotel district to the north and the City central to the east. For many it's a place to sit down, relax and just watch the world by by. Although busy, only Taxis are allowed in the main area along with large numbers of Rickshaws all waiting for business. It also acts as a good shortcut for Locals going about their Business. The Pigeons which throng to the Square are fed by locals in an area where two or three Cows are allowed to roam around. At present there's a Calf which of course draws much attraction from younger Visitors (and people with Cameras!). There are the usual Sadhus in the Square who, upon seeing a Camera about to point at them, will make a beeline for you. When I was there, the going rate for a picture seemed to be around 100 Rupees (61p - 1 dollar). 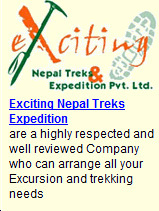 By sitting close by to them, I reckon they are on well above the average pay of a Nepalese person! Taking time out to sit alongside locals on the Temple steps is not far off any big City in the World. If you sit there long enough something's going to happen. In my case it was a somewhat heated argument between two Rickshaw Riders to some holy prayer singing from a group of elderly women. So you get diversity. As with many places in Nepal, the redness of the Temple colours on a hazy sunny day make it quite unique. Couple that with the Stall Holders selling fruit and textiles, it will bring about a feeling you are somewhere special, the hardness thing to explain to someone is the colour of everything you encountered in Nepal. 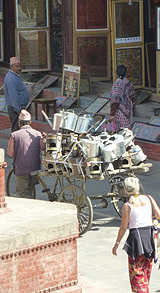 In the main Square there is a large Market area selling mainly brass and pottery wares. Being there are so many next to each other, it's a good place to buy things at very competitive prices. Normally they will say a price, you would say no, then they'll ask you to tell them what a good price is. Nepalese Stall Holders and Shop Keepers expect you to haggle, it's how they work, but respect this and don't be too silly about it! Durbar Square is a must see place, you won't get bored there.